To rescue Patrick, Liza must go Below, armed with little more than her wits and a broom. There, she uncovers a vast world populated with talking rats, music-loving moles, greedy troglods, and overexcitable nids . . . as well as terrible dangers. But she will face her greatest challenge at the spindlers' nests, where she encounters the evil queen and must pass a series of deadly tests--or else her soul, too, will remain Below forever. This marks the first ever MG I have read in a really long while. Meaning, I haven't read a MG since I was about ten or so. So as you can see, it's been a while. My main concerns with reading a MG now was that I thought that the story would be too childish and I wouldn't enjoy it as much as I would have when I was ten. Was I wrong? Oh, yes. Wrong I was. Liza is a defiant, sassy, and stubborn girl that has a deep love for her brother. She'll do just about anything for him, so when he goes missing and is replaced by a not-Patrick, she bravely sets off into a world unknown, full of wonders and terrors. She has no idea what she is getting herself into, and I have to say that's one of the main reasons why I loved her character. Her strong belief in things unseen and in herself was admirable and enjoyable to read about. Oh, sure, she had her doubts here and there, but who doesn't? We meet a whole menagerie of wonderful and horrible creatures in Liza's journey Below. Each one of them was masterfully created and vividly described by Oliver. Honestly, I would have expected nothing less of her. The imagery in the Delirium Series was spectacular. So to see that shine in The Spindlers was a happy moment for me. She created such a different and lively world in this book that it was almost as if this place were real and not made up from the mind of Oliver. Or is it . . . ? And Liza's adventure was quite the epic one! She travels all throughout Below, meets new and different creatures, and battles many foes to reach the nest of the spindlers. 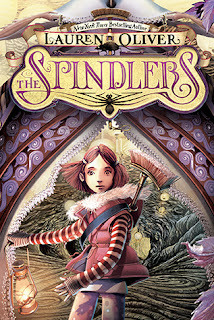 While it took me a while to get into the story, mostly because I didn't have much time to read and would only catch a chapter or two at a time, The Spindlers was fast-paced and exciting. Once I had really gotten into the story, I was turning pages faster and faster as I went along with Liza on her journey. Being that this is the first MG I've read in a long while, I was thoroughly surprised and entertained. The Spindlers tells an epic tale of a girl named Liza who must traverse Below and face many foes to save her brother's soul. It was fast-paced and jam-packed with vivid imagery and imagination. If you're looking for an MG that fits these standards, The Spindlers may be the one for you. Great review! I have this one on my shelf right now but haven't read it yet because I'm not a big fan of middle grade books. It's good to hear you enjoyed this one and I think that I might enjoy this one too.